St. Francis de Sales is patron of Catholic writers. As a blogger, therefore, I happily claim him as patron of me. As the Church celebrates his feast today, I can easily imagine him sitting with a laptop, clicking out the good news that indeed Jesus lives. Francis wrote voluminously. Not only is he known for his books, but for his (numerous) letters. He also composed short papers and pamphlets for wide distribution, to help clarify the faith in a time when confusion abounded. I like to imagine him patting today's Catholic bloggers on the back, encouraging us to 'keep it up' as we distribute our witness to the Truth in THIS age of the Church and in the turbulence of our world. Francis de Sales was a bishop and founder of the Order of the Visitation of Holy Mary. He was definitely a busy man in France in the early 1600s. Still, he found time to take up his quill pen and spread the good news of Christ. As we clack away at our keyboards, often in wee hours of the morning or while a baby naps, I'd like to think our patron is praying for us. I have a feeling he is doing just that. I agree! And I love St. Francis de Sales. So many of his quotes speak to me. Thank you, Laura. I find him so relevant to our everyday lives! I have noticed that many of my very favorite posts of yours happen to be when you quote him. I did not know he was the patron saint of writers, though. Very interesting. Kathleen, it's my understanding that his distribution of free papers and tracts is largely responsible for this patronage. I am pretty convinced that if he were living today, he'd be a blogger :)! Gosh, I'd never thought about saints editing :) ! They probably didn't have time, and I'm sure the Holy Spirit "took this into account" (smile) as He inspired them. Did not know he was patron of writers! Your quotes are gorgeous...love your style! Ahhh, it's good to find kindred spirits as we serve our Lord! Thanks be to God, and thank YOU! Keeping up with our Blogs is very important as we do not know who may visit and not leave a message. 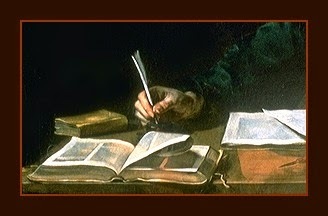 To many, our writings may be the first time they get to learn about Our Lord. Yes, Victor - so true! Thanks. Lovely thought, indeed. I'll receive the dear man's prayers on my behalf too, a celestial member of that great cloud of witnesses. Knowing he wrote many letters encourages me, as much of my writing to encourage comes in the form (or genre) of letter writing. Blogging is a part of that now as well. And it WAS a beautiful day - I spent some of it with my 6 year old grandson (smile smile smile). Hope your day was lovely as well. I was going to drop dead if it weren't Francis de Sales. I jokingly attribute this quote to him: "Preach the Gospel at all times; use words." Whew - I'm so glad it's Francis de Sales, because you're needed here on earth awhile longer!